Happy Valentine’s Day! Some people think it’s an overrated holiday, and I tend to be one of those people. But it’s also a nice day to show the people you love how much you care about them. We have a tournament this weekend, so I’ll be spending my day with some of the people I love the most: my teammates! Before I leave, I’d like to kick off the weekend with a great dish I made last week, inspired by this recipe from Cookie and Kate. I’d never thought of adding the curry flavor to the quinoa before, but it sounded like a great idea, and it was delicious! The quinoa turned out creamy and delicious, with just the right amount of spiciness from the curry powder and a touch of sweetness from the raisins. Yum! As always, I loved the roasted vegetables. I also wanted to add some protein to make this a complete meal, so I decided to try roasted chickpeas (or garbanzo beans, they’re the same thing). They were pleasantly crispy and delicious! Although if you save leftovers, store the chickpeas separately, since otherwise they lose their crisp. Overall, this dish was full of delicious flavor, and the textures came together beautifully. The creamy quinoa, the soft vegetables, and the crispy chickpeas were a great combination. So here you go, a healthy, vegetarian dish. It would be great to try out over the long weekend! Preheat the oven to 400˚F. Rinse the garbanzo beans and pat dry with a paper towel. Toss in olive oil and season to taste. Bake for 30-40 minutes, until crispy. Toss the broccoli and cauliflower in olive oil and seasoning, and bake for 20-30 minutes, until tender. While the vegetables are roasting, prepare the quinoa. Place the quinoa, coconut milk, and water in a pot and bring to a boil. Reduce to a simmer and allow the liquid to absorb. When the liquid has almost completely absorbed, add the green onions, spices, and onions and stir to combine. 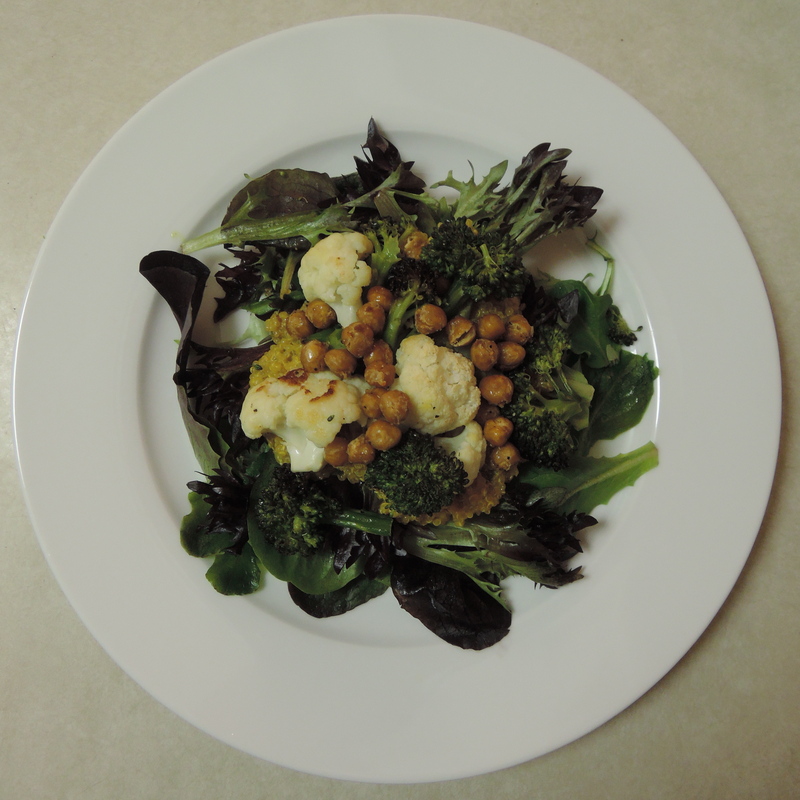 To serve, lay down a bed of mixed green, place a scoop of quinoa over that, then top with roasted veggies and chickpeas. Enjoy! This entry was posted in Uncategorized and tagged Broccoli, Cauliflower, Coconut Curry Quinoa with Roasted Chickpeas and Vegetables, Garbanzo Beans, Main Dish, Quinoa, Vegetarian.